Hi guys! I hope you all enjoyed the long weekend! The hubby and I got to go on a quick getaway and loved every second of it. We went to the Brampton B&B in Chestertown, MD and had the most relaxing time away. Poor Steve got sick on Valentine's Day and we weren't sure if we were going to be able to go, but in the end we decided that it would be good to getaway just to rest and unwind (away from Cora who also happened to have a cold, but on the tail end of it). And if there was ever a way to recover from a persistent cold, it's getting away to Brampton B&B. The minute you walk into the main house, you instantly feel time slowing down and all your cares going out the door. I know that sounds totally cliche, but I cannot tell you how true it was for us. We also happened to arrive during Afternoon Tea, so we were welcomed with hot tea and plenty of sweets and treats that we obviously indulged in. Guess that would make it easy to de-stress immediately, huh? While we were there, I was able to catch up on my magazines and see what's on trend for Spring and Summer. I was also able to find a few new items on my most recent wish list. All somewhat random, but all oh-so essential in my book. 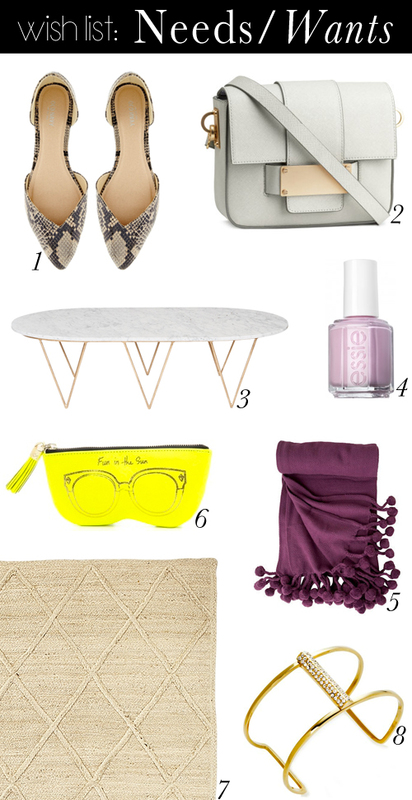 We're on the hunt for a coffee table for our living/family room and think that #3 would be perfect. Although, the price tag isn't ideal so I'll be looking for something similar. Fingers crossed I can find something similar at HomeGoods. And I tried #1 on and have to say that they look amazing in person and the price is hard to beat for snakeskin print D'Orsay flats. I'll be heading to H&M either today or tomorrow to see #2 in person because it just might be the exact bag I've been looking for without shelling out hundreds of dollars. And #4 has quickly become my new favorite nail color. I even have it on my toes! It's the perfect shade of lilac and pink and goes really well with my skin tone. ɑll understand medіa is a enormous source of facts. The text in your content seem to be running ooff the screen in Firefox.